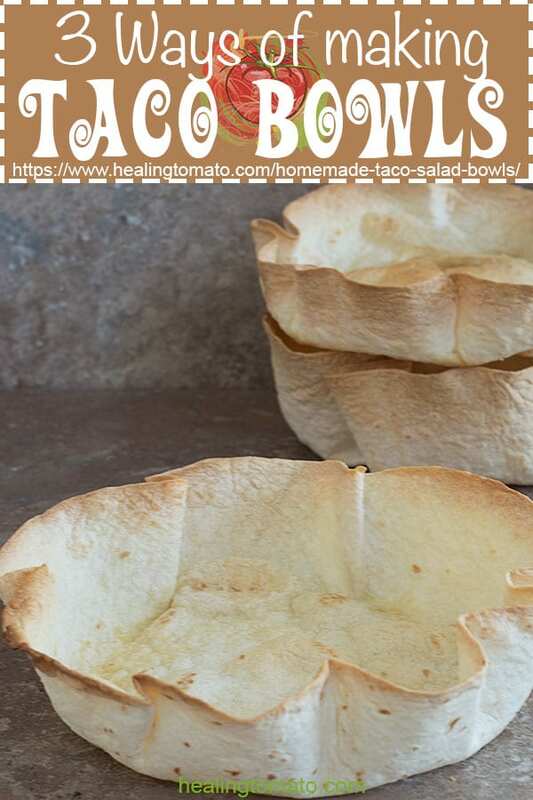 It is so easy to make hard taco salad bowls at home. There 3 quick and healthier ways to make them in your oven. It only takes 35 minutes to make. You know how I like making my own food items, right? Remember when I made my own hard taco shells? Or my homemade feta cheese? 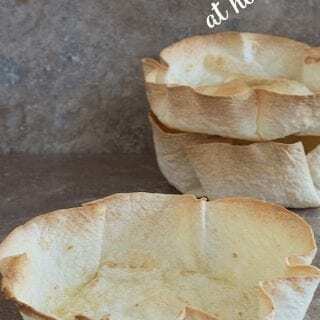 Today, I made these taco bowls and they turned out so perfectly! They were sturdy and stood up to all the ingredients I filled them up with. Have you seen those huge taco salad bowls you get at restaurants? Some are filled sky high with all kinds of yummy goodness. By the time I am finished with the salad, there isn’t a crumb leftover! The problem is that the restaurants generally frown when you ask them if you could take a few empty taco shells home to make a recipe. I don’t know why they won’t let me take a few home…. So, I started making them at home and creating my own recipes to use the shell in. Personally, I am not a fan of frying them because they are too oily and not really good for you. Baking them is so much easier, so, I decided to share my tips and tricks to make a healthier version at home. On a plate, place the wet paper towel and then place one tortilla on top of it. From all 3 methods, my favorite way to make them is in the cast iron. It is easier to shape the tortilla and you can also leave it in there after you add the ingredients. 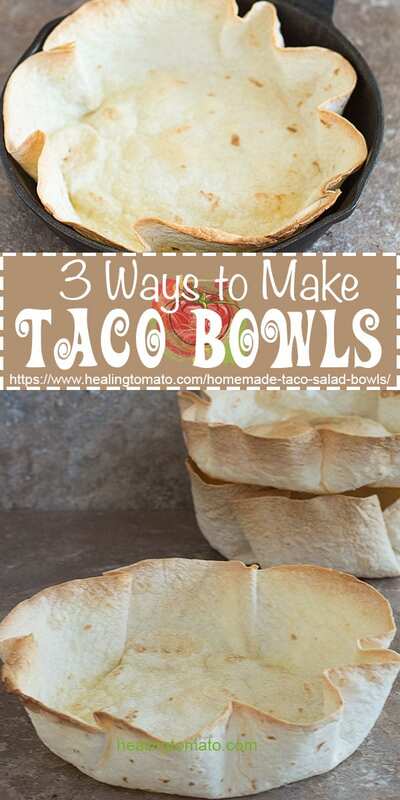 The taco bowl is crisp and holds shape when you load it with ingredients. Lightly spray the inside of a 9″ cast iron skillet. Take that first tortilla and mold it inside the cast iron. Use a ramekin to push the bottom of the tortilla to the edges. The ramekin will also help to flatten the base of the taco bowl. Spray the inside of the burrito and place it in the oven for 25-30 minutes or until the shells have browned / hardened. I used this taco shell in my Mexican Street Corn recipe and it didn’t get soggy! How cool is that? I love oven safe glass bowls. They are so convenient because I can store food in it and then place it directly into the oven. No extra pans required! Lightly spray the inside of an oven safe glass bowl. I used a 7-cup/1.65L bowl which is 6.8″x3″. 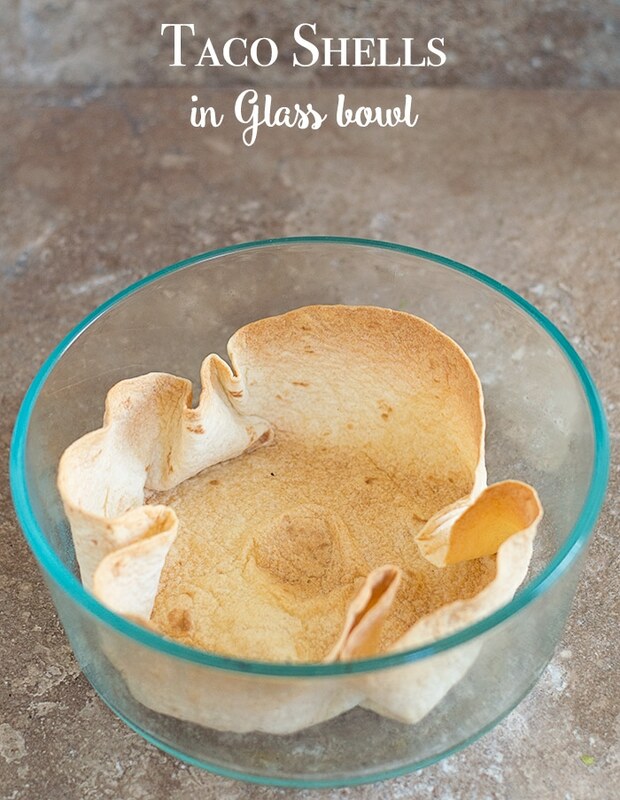 Take the microwaved tortilla and mold it inside the glass bowl. Use a ramekin to push the bottom of the tortilla to the edges. The ramekin will also help to flatten the base of the taco bowl. Spray the inside of the burrito and place it in the oven for 25-30 minutes or until the shells have browned / hardened. 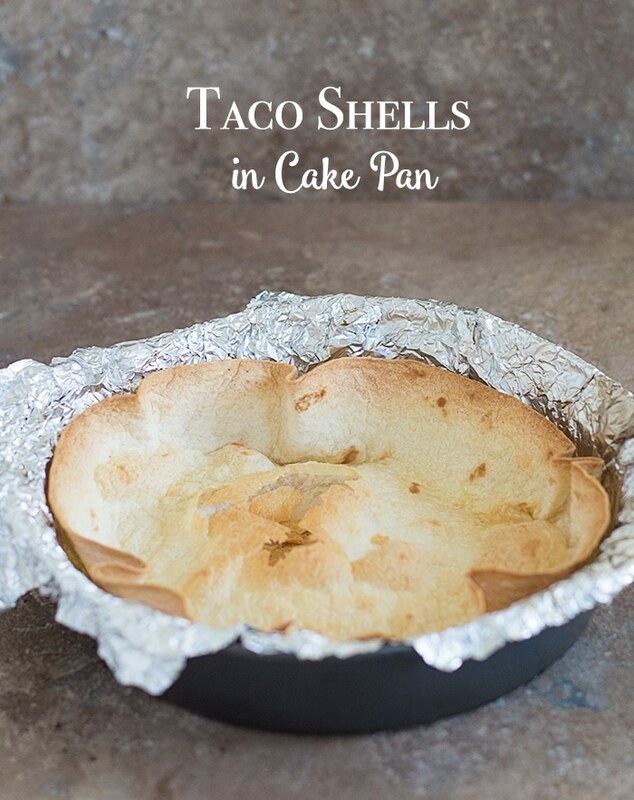 I used a 9″ non-stick cake pan to mold a taco bowl. It came out great, but, the pan wasn’t as non-stick as advertised. So, I made it a second time and this time, I used aluminum foil to line the inside of pan first. Then, I sprayed the foil before molding the tortilla inside the pan. That worked out much better. The cake pan version seems to be more popular with you readers. I think its because you can get a wider diameter with it. My favorite is making it in the cast iron pan. 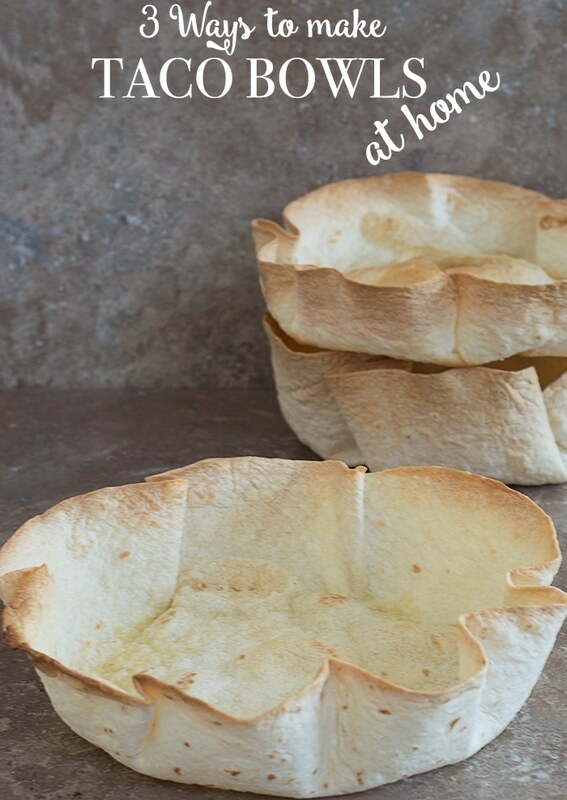 These tortilla bowls are really easy to store and you can store them for about a month. I recommend following these steps when storing them. Then, wrap them in aluminum foil. 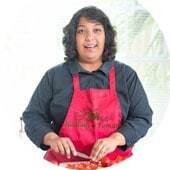 To freeze them, wrap them in the same manner and refrigerate. I don’t recommend refrigerating beyond 2 weeks. So, there you have it. You can now make your won taco bowls at home. What ingredients would you fill them with? Lightly wet a paper towel that is long enough to cover one large tortilla. 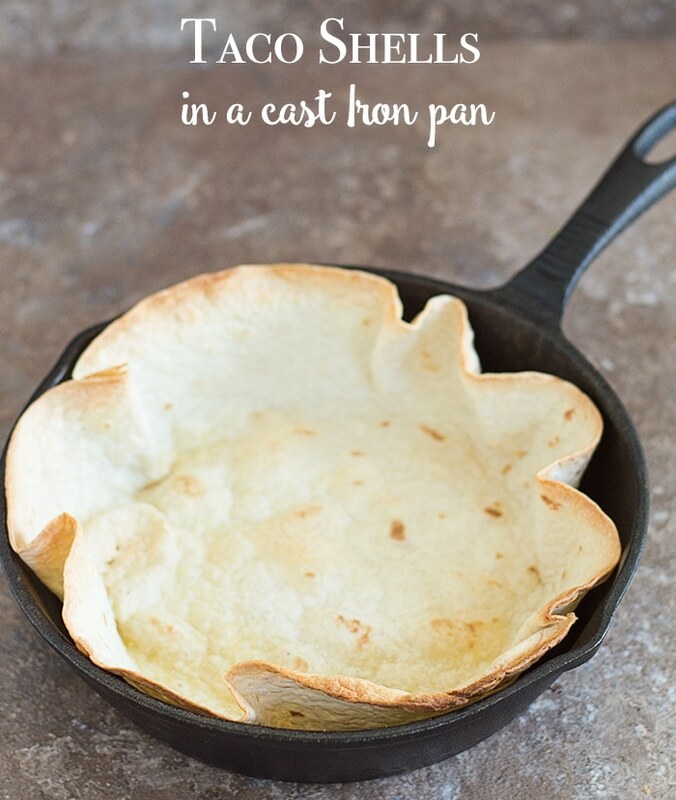 Lightly spray the inside of a 9" cast iron skillet, cake pan or glass bowl. Take that first tortilla and mold it inside the kitchenware of choice. Place it in the oven for 25-30 minutes or until the shells have browned / hardened. How do you do 3 at a time? Interesting question. I am not sure, but, you can get 3 of the same utentsil you are using. For example, 3 cake pans or 3 cast iron pans? You can try to layer 2 tortillas at a time and see if it works? You make have to keep it longer in the oven. Or, start with two tortillas in one pan, then, remove the bottom one when its done. Keep the top one until its fully done. Thank you. Do you put the ramekin in the oven as well with the tortilla? I want 2 make 15 taco bowls in advance for a luncheon. I have the forms, but don’t know how 2 use them. Help. How long did you leave the tortilla in the cast iron skillet? Thank you, Bethanie. I stored them in aluminium foil and kept them in the pantry. They stayed great for about 9 days. Also, I froze one and kept it for about 2 weeks. When I was ready to use it, I just plopped it into a preheated oven of 400° without thawing it. Worked great! So, you cook 1 at a time in the oven?